Broadly speaking, the benefit of an injection quill is two-fold. First, injection quills provide a safe and effective means of connecting a liquid chemical feed to a pipeline or vessel. Second, they can aid the efficiency of the feed system. They accomplish this by delivering the chemical to the interior portion (typically middle 3rd) of the process flow, where flow velocities are highest. By doing so, the system maximizes the existing process dynamics to aid in mixing. 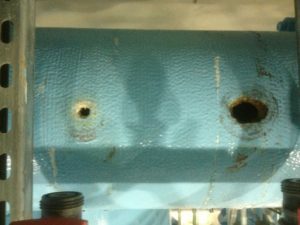 On the right, damage caused by directly feeding a corrosive chemical - without using a quill - can be seen. Treatment chemicals present a variety of risks and hazards. It is the job of the entire metering system to mitigate these risks while simultaneously delivering the proper amount of chemical to where it is needed. Injection quills, being an integral part of metering systems, are no different. A proper quill will work to efficiently deliver chemical while protecting operators and equipment. Quills not only connect the chemical feedline to the process main but they dose the chemical into the interior section of the flow, away from the sidewall and fittings which are often made of materials that are incompatible with the chemical. While this helps to prevent damage it also has the added benefit of introducing the chemical into the higher velocity interior section of the flow. This allows the chemical feed to make the best use of existing flow dynamics to improve chemical mixing.